Embroidery refers to the art of embellishing fabrics and other materials using thread or yarn and a needle. Besides thread, embroidery can also use other decorative materials including metals, pearls, sequins and beads. It is most often used to decorate various pieces of clothing and accessories including hats, dresses, caps, shirts, etc. The art of decorating fabrics using yarn/thread and a needle hasn’t changed much over time. On the contrary, modern embroidery continues to use the techniques or stitches which have been used for thousands of years including running stitch, cross stitch, chain stitch, satin stitch and buttonhole stitch. Furthermore, machine embroidery mimics hand techniques. But while it looks almost identical to hand embroidery, mechanised decoration of fabrics involves the use of multiple threads, while the machines also use different techniques. Embroidery dates at least to the Warring States Period in China or the period between 5th and 3rd century BCE. It evolved over time, while the materials and techniques used varied greatly from one region to another and continue to do so until the present-day. Throughout most of history, embroidered clothing and other items were closely associated with status and wealth in most parts of the world from the Far East to ancient Persia and Byzantium to medieval Europe. After the introduction of machine embroidery during the Industrial Revolution, hand embroidery began to decline but it remained popular until the present-day both as a form of textile art and handicraft. Counted-thread embroidery. It creates patterns by making stitches on the foundation fabric over a set number of threads which are determined in advance. Most commonly used foundation fabrics in counted-thread embroidery include aida cloth, canvas, and special cotton and linen. Needlepoint and blackwork embroidery are also a form of counted-thread embroidery. Canvas work. It is characterised by making stitches into a fabric in a way that the pattern completely covers the fabric. Canvas work often involves the use of printed or painted canvases which serve as a guide. Traditional canvas work was based on counted-thread technique. Drawn thread work and cutwork. 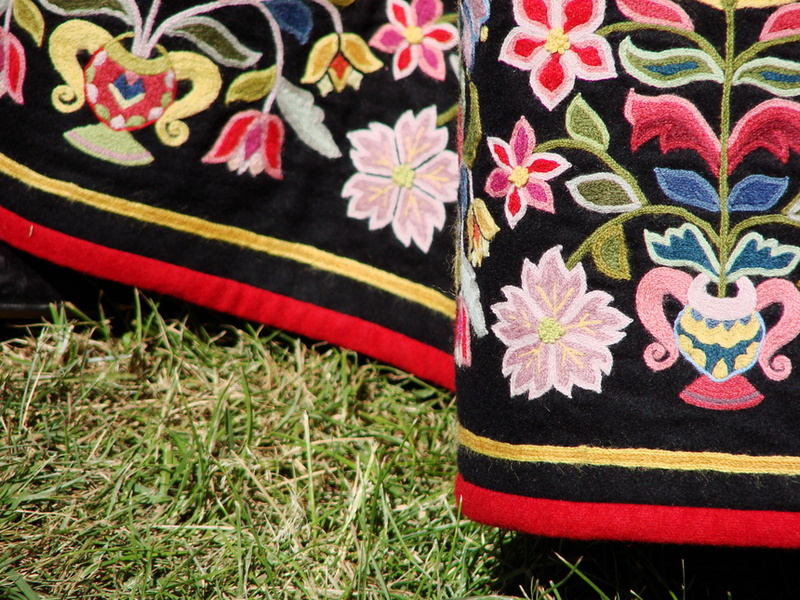 This two types of embroidery involve deformation or cutting of the foundation fabric which is then decorated with thread, typically in the same colour as the fabric. Drawn thread work and cutwork on a white foundation fabric are known as whitework. Fabrics and threads used in embroidery vary greatly in time and space. Some of the most commonly used fabrics include linen, cotton, silk and wool which can also be used as thread. Today, embroidery also uses a variety of novelty threads and yarns which can be used in combination with the traditional ones.